The 25th century BC is a century which lasted from the year 2500 BCE to 2401 BCE. c. 2900 BCE – 2334 BCE: Mesopotamian wars of the Early Dynastic period. c. 2500 BCE: Scribal schools do well throughout Sumer. c. 2500 BCE: Cylinder seal from Sumer and its impression are made. It is now in the Metropolitan Museum of Art, New York. c. 2500 BCE: Excavation and development of the Hypogeum of Ħal-Saflieni at Paola, Malta, a subterranean temple complex subsequently used as a necropolis. c. 2500 BCE: Valley Temple of Khafra, Giza, is built. 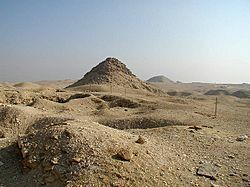 c. 2500 BCE: Khafra from Giza Valley, Temple of Khafra is made. Fourth dynasty of Egypt. Discovered by Auguste Mariette. It is now kept in Egyptian Museum, Cairo. c. 2500 BCE: People in Peru rely on fish and mussels for food. c. 2500 BCE – 2000 BCE: Mohenjo-Daro is about 7 square miles (18 km2) in size and has a population of c. 20,000 to 50,000.
c. 2494 BCE: End of Fourth Dynasty, start of Fifth Dynasty in Egypt. Construction of the Pyramids begins. c. 2494 BCE – 2345 BCE: "Sculptors at work", relief from Saqqara, Fifth Dynasty. It is now at Egyptian Museum, Cairo, Egypt. c. 2494 BCE – 2345 BCE: "Seated Scribe" from tomb of vizier, Saqqara, sculpture, Fifth dynasty of Egypt is made. It is now in Musée du Louvre, Paris. 2492 BCE: Traditional date for the legendary foundation of the Armenian nation (see Haik). c. 2450 BCE: End of the Early Dynastic IIIa Period and beginning of the Early Dynastic IIIb Period in Sumer. Harappan civilisation, at its peak, covered an area of around 480,000 km² (298 258.172 mi²). Its heartland lay in the Indus river valley in Pakistan, but settlements spread as far as the Makran coast, Baluchistan, Afghanistan, eastern Punjab, Kutch and Saurashtra. They included cities like Harappa, Mohenjo-daro, Kalibangan, Dholavira, ports like Lothal, Sutkagen-dor and Sotka-koh and many villages as well. They used irrigation to farm and built cities. The two main cities had sewage systems, bronze, trade tokens (early coins), and hieroglyphs. There were even baths at one of the villages, besides the great baths of brick in each city. Geometry of shrines and altars tends to identify these with the cities of the Yajur Veda: they might easily be a thousand years older than this conservative date. 25th century BC Facts for Kids. Kiddle Encyclopedia.